Pauline Wengeroff was born in 1833 into a pious Jewish family in Bobruisk in the Pale of Settlement (now Belarus); she died in 1916 in Minsk. Her life, as recounted in this biography, based in part on Shulamit Magnus’s award-winning critical edition of Wengeroff’s Memoirs of a Grandmother, was one of upheaval and transformation during Russian Jewry’s passage from tradition to modernity. Remarkably, Wengeroff's narrative refracts communal experience and larger cultural, economic, and political developments through her own family life, interweaving the personal and the historical to present readers with an extraordinary account of the cultural transformation of Russian Jewry in the nineteenth century. Wengeroff's is the first piece of writing by a Jewish woman to display such authorial audacity and historical consciousness and the first contemporaneous account of Jewish society in any era to make the sensibilities and behaviour of Jewish women—and men—a central focus, providing a gendered account of the emergence of Jewish modernity. In this, her memoirs are a full counterpart to the androcentric autobiographies of her contemporaries, the maskilim (leaders of the Jewish enlightenment movement in eastern Europe), and the basis for much new thinking about gender and modernity. Shulamit Magnus probes Wengeroff’s consciousness and social positioning as a woman of her era and argues that, though Wengeroff was well aware of the women’s movement in Russia, she wrote not from a feminist perspective but as a by-product of her socialization in traditional Jewish society. A brilliant woman who 'loved books', Wengeroff produced a carefully crafted, beautifully written, and compelling account of tradition and its demise; of intergenerational and marital strife over Jewishness; and of betrayal, loss, and hope. 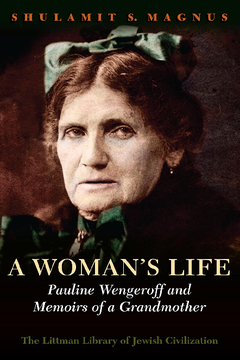 Despite a dramatic and readily accessible narrative line—what Magnus calls ‘Wengeroff’s myth of her life story'—Wengeroff embeds much counter-evidence in her memoirs that subverts this same myth. Why she constructs the particular myth she does, and also, if unconsciously, subverts it, is a major focus of this study. Using archival and secondary sources, Magnus goes beyond constructing a portrait of Pauline Wengeroff, her family, and her social circles to consider how Memoirs of a Grandmother came to be in the form in which we have it: she writes a biography of a literary work as well as of a woman. She documents its astonishing success: published for the first time (largely in German, in Berlin) in 1908, it was republished in 1910, 1913, 1919, and 1922 to rave reviews, in the Jewish but also the non-Jewish press, in Germany, Austria, Russia, and even the Netherlands. Organized topically rather than chronologically, Magnus’s study gives readers entrée to Wengeroff’s life, aspirations, and her disappointments—above all, with her husband, who ridiculed her attachment to traditional observance and forced her to relinquish it and with her seven children (three of whom converted to Christianity; none of the others were committed Jews in any fashion)—raises the question of Wengeroff's actual, intended audience for Memoirs of a Grandmother. Magnus argues that, Wengeroff's title notwithstanding, it was not her biological offspring but other ‘grandchildren’ from among the Jewish youth of the fin de siècle, who shared her Jewish cultural nationalism—and her affinity for Herzlian Zionism. Finally, Magnus probes the reception of Memoirs on two continents, Europe and North America, to reveal a surprising story of the same work being read both as an apologia for tradition and for assimilation and even conversion—both fundamental, if revealing, misreadings, she argues. When Wengeroff died in 1916, the world was very different from the one in which she had grown up. Her story makes a significant contribution to Jewish women's history; to east European Jewish history; to the history of gender, acculturation, and assimilation in Jewish modernity; and to the history of Jewish writing and Jewish women’s writing.